Jury Nullification: DEMOCRACY DEFINED Campaign for Restoration of genuine Trial by Jury. 8, RUE DE LA BRASSERIE, 55700 OLIZY, FRANCE. Since 1992, Kenn d’Oudney, Mrs. Joanna d’Oudney & Astra d’Oudney, have run the not-for-profit Democracy Defined Campaign. SOUTH AFRICA, THE UNITED STATES, AND ENGLAND. The DEMOCRACY DEFINED CAMPAIGN PHILOSOPHY is enriched by the fascinating quoted wisdom and words of great minds ― Churchill, Gibbon, Hale, Hallam, Hume, Blackstone, Crabbe, Millar, Mackintosh, Gilbert, Palgrave, Coke et al., chief justices, judges, Benjamin Franklin, Presidents Kennedy, Roosevelt, Adams, Jefferson, Madison, Washington, Lincoln. The Campaign Philosophy is extensively researched and eye-opening ― it reveals in irrefutable detail how far the modern political establishment and justice system have strayed from the legal, lawful modus operandi. The Campaign Philosophy explains how the specific components of constitutional democracy have been suppressed by malefic statist interventions to produce the modern Western decline and the Illegality of the Status Quo. However, while establishing the case against governments’ statism, the Campaign gives people inspiration and hope by showing how Restoration of the definitive parameters of true Democracy reverses the decline and makes mankind’s ideal society achievable: the best of all possible worlds. The Campaign Philosophy is supported by people from all avenues of endeavour, including academics, doctors and judges (U.S. & U.K.). To promote the well-being of people everywhere, the Campaign militates on behalf of Democracy, Personal and Political Freedom, Truth, Knowledge, Justice and Liberty. If you want to join in and do something positive to make your world a better place in which to live, join the Campaign (gratis). You can download and distribute the free posters and educational pamphlets, and contact us today for your free Membership and privileges (click on the Membership button above). Welcome! Purchasing Democracy Defined books supports the Campaign. 272 pages, large size 8½" x 11" Paperback. HIS HON. JUSTICE PATRICK S.J. CARMACK, Producer of The Money Masters video documentary. HOWARD PHILLIPS, Founder, U.S. Constitution Party, three-time Presidential nominee; Chairman of the Conservative Caucus. 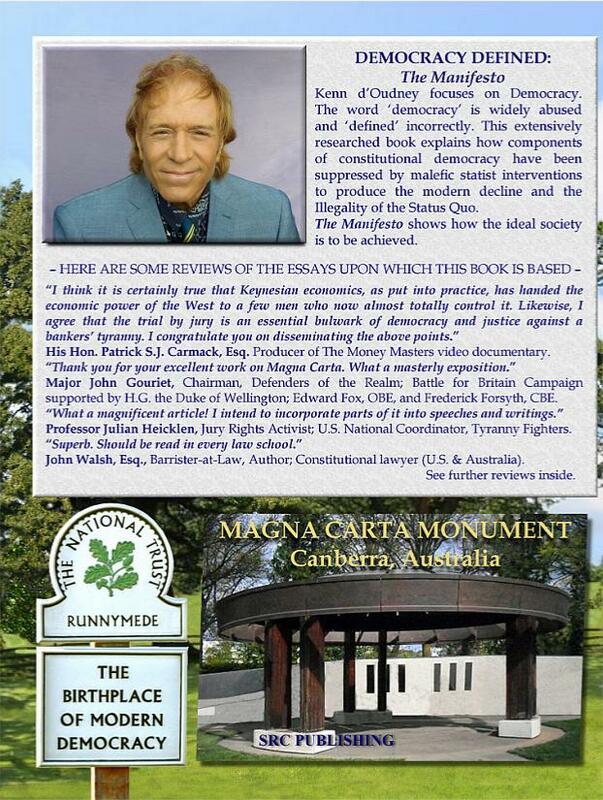 JOHN WALSH, Esq., Barrister-at-Law, Author; Constitutional lawyer (U.S. & Australia). SIMON RICHARDS, Campaign Director; The Freedom Association; Founded by John Gouriet; the Viscount de L’Isle, VC, KG, PC; Ross McWhirter and Norris McWhirter, CBE. SO, YOU THINK YOU KNOW WHAT ‘DEMOCRACY’ MEANS? The word ‘democracy’ is widely abused and ‘defined’ incorrectly. 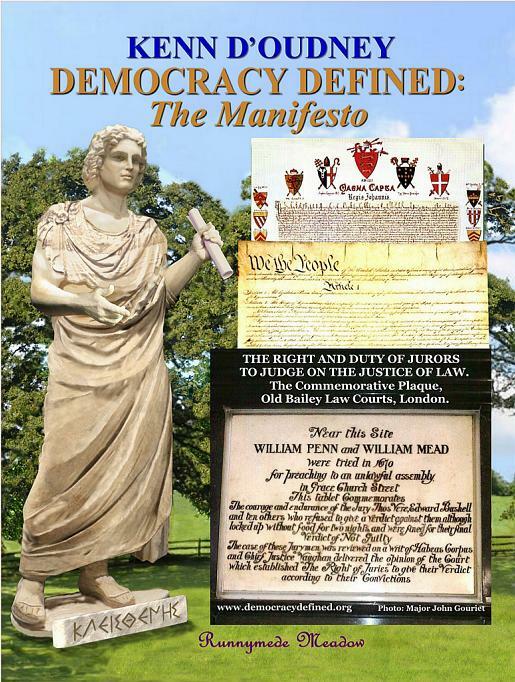 Kenn d’Oudney’s book explains exactly what the word democracy really implies. It demonstrates just how illegal the current situation is, adversely affecting the lives and livelihood of nearly all men and women today. It sheds light on how democracy involves a variety of far-reaching issues, including political assassinations; the Ætiology of Anti-Semitism; fraudulent Fractional Reserve Lending banking practices; and the national issuance of interest-free currency and credit. The historical, legal and constitutional facts and quotations in this book establish the perennially subject and liable status of the executive, legislature and judiciary to the universal timeless secular moral and legal tenets of equity and cost-free private prosecutions at Common Law Trial by Jury. The Manifesto exposes fallacies of "constitutional" groups and individuals and is indispensable reading for anyone who wishes to uphold the West's cherished heritage of Liberty and Equal Justice. The Manifesto gives citizens all the facts they require to know how and why the current system is profoundly wrong and sets out what "We the People" can do to rectify it. Is Your Government a Despotism? GENUINE LEXICOGRAPHY is dictated by the Sciences of Etymology, Semantics, Semasiology, and Philology. These determine whether a country is a definitive democracy or one’s government is a despotism. Following the invention of printing, the meanings of words started to become more stable but publications were pricey and rare, and literacy was the acquired esoteric advantage of the privileged few. Consequently, the spoken word vocabulary remained subject to uncertainty and flux. It was in the modern historical era, since the development of these sciences and the spread of literacy, that the signification of words became generally set. Above all, we have the incomparable Eighteenth Century work of Doctor Samuel Johnson to thank for that. As a result, the great historical, legal and philosophical opuses of the likes of Gibbon, Palgrave, Millar, Gilbert, Hale, Crabbe, Hallam, Spooner, Blackstone, Mackintosh, Hume, Jefferson and Macaulay remain as immediately comprehensible as the writings of our contemporaries. That is to say, modern writers’ efforts are intelligible only if the contemporary scribe first learns and then respects the etymology of vocabulary. Let us begin by clarifying what democracy is not! For example, Suffrage does not define nor does it produce democracy, for electoral voting takes place in totalitarian, fascist, communist, and National Socialist (Nazi), i.e., anti-democratic, states. Having been elected, there is nothing to stop government from imposing control of an upper house, reneging on pledges, nor from adopting any tyrannical measures it chooses. Viz. The word ‘democracy’ is widely abused and ‘defined’ incorrectly: Democracy is a state of society realised neither by referenda (mass voting for new laws), nor by suffrage (electoral voting for representatives), nor by the representatives’ majorities’ legislatorial voting. Electoral voting, majority rule and ‘consensus politics’ neither create nor define democracy. To preclude arbitrary (i.e., tyrannical; illegal) government and establish liberty and equal justice for all, the Hellenes created the society in which the common people have the power in Trial by Jury to judge the laws and overrule laws and measures enacted by the national assembly. The word the Hellenes gave to describe this state of society in which the citizens have control through the Trial by Jury to judge, make and enforce the laws and overrule the government, the wealthy and powerful, the aristocrats and all the people who sought to rule them, was demokratia, which translates into English as Democracy. Democracy is founded on the Trial by Jury, derived from the Hellenic Athenian Constitution of government by Trial by Jury. Through its etymology, history and signification, the word democracy designates the constitutional justice system. Modern Constitutional Democracy is based on the sovereignty* of the individual citizen-juror as the final arbiter of law and protection of the people from tyranny. *Definition. Sovereignty, pre-eminence; the supreme and independent power expressed through the making and enforcing of the laws. The Hellenic Athenian Constitution of government by Trial by Jury was a conspicuous achievement in human history for constitutionally establishing this unique mode of justice. The aristocrat Cleisthenes it is who must be credited with the creation of mankind’s first democracy in 508/7 B.C.E. (although ‘infant’ in form, as it did not yet give equality to women and permitted slavery. Points to note: foreigners were not citizens; and slaves were convicts or foreigners.) Cleisthenes brought acknowledgement to the need to spread empowerment throughout society to promote equal justice, liberty, peace and prosperity, and devolved power all the way down to the poorest (male) citizens, the thetes, by recognising rights, exousia. Exousia rights included the right to attend, debate and vote in the national assembly on laws and measures (referenda); the right of the accused to a Trial by Jury; and, crucially, the empowerment of citizens by bestowing on them judicial authority as Jurors in Trial by Jury in which laws and measures passed by legislatorial majorities in the assembly could be judged, overruled and annulled (1) whenever this was deemed by the Jurors necessary to serve justice, liberty, and the interests of the people. 1 See Works, Vol. 2, Chapter Six, by co-author of the U.S. Constitution, Justice James Wilson. Democracy created the illustrious Athens which successfully resisted the Persian invasions of 490 and 480/79 at the battles of Marathon and Salamis; which built the Parthenon; set enduring standards in art and architecture; developed sciences including those of medicine, mathematics and astronomy; proffered a stage to Aeschylus, Sophocles, Euripides and Aristophanes; and laid the Western foundations of rational and critical thought. Hellenic Greece of the Constitution of government by Trial by Jury received from the Athenians the defining epithet, Democracy. The historical facts about Democracy in Hellenic Greece and everywhere else are that it was a virile system and devotedly supported by the mass of just, civilised, peace and freedom-loving people. Democratic free Athens eventually only succumbed because of the mighty invasion of the Macedonian, Alexander the Great (conqueror), who emplaced his generals as autocrats to rule by might over right, with force against democracy’s egalitarian system of equal justice and civic liberty. Otherwise, the Hellenic Culture would almost certainly have evolved into the development of equal rights for women, emancipated the slaves and outlawed slavery 2,000 years ago. As is the way with the conquerors of history, alas ― Alexander’s far-flung martial exploits set back the socio-political progress and development of humankind. Naturally, people have the moral responsibility, the right and the duty to resist and suppress injustice wherever it occurs, and by whomsoever it is perpetrated, governments notwithstanding. By definition and in practice, Democracy and Justice require that the People at all times retain the Supreme Power to annul injustices and the bad laws made by fallible politicians. This Power backed by the full apparatus of police, prison service and Armed Services, is uniquely embodied in the Citizen-Juror’s Duty in Trial by Jury: to judge the justice of every act of law enforcement, and to render the Not Guilty Verdict whenever conviction or punishment of the accused would be unfair according to the juror’s conscience. According to legem terræ* common law, it is the jurors’ duty in Trial by Jury to judge the justice of the law and every act of enforcement and acquit any persons accused under an arbitrary, unjust or apocryphal statute, regulation or prosecution. *terræ is pronounced terry, the ‘æ’ as in Cæsar, seize. Hellenic Greek, Demokratia, Democracy. demos, the people; kratos, sovereignty*, power; kratein, to rule. *Perseus Digital Library, Tufts University. MSN Encarta. Democracy, demos, the people; kratein, to rule; etc. From the etymology comes the definition: Democracy, the form of government in which the Sovereign Supreme Power is vested in the Common People; the emancipation and ethos of society produced by the power of Juries of ordinary citizens in Trial by Jury, to vet, judge, decide (make), and enforce the law; the people rule. In order to understand the meaning of the word, it is essential to know first that democracy embodies the people’s responsible control over government and law through the Trial by Jury. The people control the government, not the other way around. The people rule. This is democracy. The power, right and duty of Jurors to decide the verdict according to their convictions and conscience have been established in Common Law since the pre-historical incipience of judicium parium, “the judgement of social-equals,” pares or peers, which is the Trial by Jury Justice System. This is because it is a definitive part of the Juror’s Duty to uphold justice by protecting the ordinary people, the meek and innocent, from the crimes of lawlessness and injustice being inflicted by those in positions of power. See p. 32 of Crabbe’s History of the English Law. 1, 2 & 3 See vol. 3, Blackstone’s Commentaries on the Laws of England, pp.34-5. Also see sections herein on King Alfred the Great, Chapter Three; and, Trial by Jury Courts Prior and Subsequent to Magna Carta, Chapter Six. Publius Cornelius Tacitus, 56 - 117 C.E., was a historian, philosopher, lawyer, senator and governor of Asia (Anatolia). He traversed much of the Roman Empire and recorded for posterity. He referred to Christ, his being brought before Pontius Pilate and execution, and early Christians in Rome. One of his perspicuous observations was, “The more corrupt the state, the more numerous the laws.” How true that remains! *Definition, coeval, adjective, having the same age or date of origin; existing at the same time as another person or thing; contemporary. coeval, noun, a person or thing of approximately the same age; a contemporary. THE ETERNAL CRITERION OF JUSTICE. All societies govern by their Justice System, regardless of time or place, race, culture, religion, background or nationality. The power to punish carries with it ALL power. It remains a universal criterion of justice that the validity and justice of laws and all acts of their enforcement require to be judged not by those who make and enforce the laws (government), but by those who voluntarily agree to abide by the laws (all adult citizens). All men and women who do not uphold this tenet are then promoting unlawful rule by a tyrannical élite. Unwittingly, or for self-advantage, they serve despots, abet tyranny, and are the criminal enemies of freedom and equal justice. For these reasons, the right to Trial by Jury is universal, inherent and inalienable. For these same reasons, the slightest attenuation of this right constitutes the crime of High Treason at Constitution and Common Law (see (X) treason, Legal Definitions Unalterable at Common Law, Constituents of Democracy; Chapter Three). Because the fairness and justice of the laws and all acts of law enforcement require to be judged by those who agree to abide by the laws, according to natural law, common law, constitutional law, and the paramount requirement for equal justice, the Common Law Trial by Jury of ordinary adult citizens in which the jurors judge the justice of the law and each act of enforcement, is the only justice system which is legal and just everywhere, for all process of law, civil, criminal and fiscal. On the aforesaid grounds, there can be NO legal enforcement of any law but by the Trial by Jury, and that is why it is emplaced as the sole justice system for all causes (lawsuits) by all the legitimate Constitutions. It is uniquely in the nature of Trial by Jury that juries fulfil the purpose of law in a democratic society. This is to maintain Justice by protecting the citizen from injustice and crime of all kinds, whether perpetrated by the state or by other citizens; and to uphold the rights, freedom and legitimate interests of all. Trial by Jury defines democracy, for the Juror is sovereign in Trial by Jury: the people rule. It is not to be supposed that a populace would voluntarily agree to be ruled under unjust laws. Nor are those who are punitively held against their will to any law which they deem unjust, anything other than oppressed and, de jure, enslaved by the law (unless they have been through a Trial by Jury of their equals and found guilty of an act of injustice committed with malice aforethought against a law specifically adjudged by the jury to be just, applicable, legal and fair for enforcement (see sections, Are You a Freeperson or Slave in Chapter Four, and Churchill’s View (1), (2), and (3) in Chapters One, Three and Six, respectively). This protection from crime and injustice committed by government is a fundamental purpose of Trial by Jury. It is put into effect by the juror pronouncing the Not Guilty Verdict to acquit the accused, thus to annul the prosecution of unjust laws, bad governance, and the failings of judges. Protection is further implemented by ordinary citizens’ cost-free private prosecutions (single or multiple plaintiffs) of malefactors, including those who acquire positions in government and abuse their power (no ‘immunity’; ref. Articles 40 and 61). At re-Trial by Jury following appeal, the Trial by Jury furnishes redress for miscarriages of justice. As explained hereinafter, Trial by Jury also provides citizens with the Mechanism for Expunction of unwanted or unjust Statutes (Chapter Four). ~on the admissibility of evidence (evidence not being pre-selected or screened-out by government or judge and/or prosecutor). The Jury Comprises the Supreme Legislature and Judicature. United States v. Moylan; U.S. Fourth Circuit Court of Appeals, 1969, 417 F. 2d 1002. Neither in the United States, Britain, Eire, Australia, Canada, New Zealand, nor in all of Continental Europe and elsewhere, have legislatures ever been invested by the People with authority to impair the powers, to change the oaths, or abridge the jurisdiction of jurors to govern government; nor to remove the universal Right of the accused to the Trial by Jury of peers for any charge or offence whatever, however serious or trivial. Today, U.S. v Moylan is not exemplified by the modus operandi of courts. Democracy has been overturned by judicable* miscreant politicians, bureaucrats, judiciary and the collusion of participating members of the legal profession. The genuine Trial by Jury process is no more (ref. above, the illegally denied Juror’s Duties definitive of Trial by Jury). *Definition. judicable, that which may be tried by jury in a court of law. THE ILLEGALITY OF THE STATUS QUO. Anyone acquainted with the process of law in the United States, Britain, Australia and elsewhere today, will see how far removed the practices of courts are from the ideals and legally binding stipulations of those nations’ Constitutions. Today, every single one of the above requirements definitive of Trial by Jury (including judging on the facts of the case) is illegally forbidden, interfered with and/or obstructed by government ‘judges’. Labyrinthine deceits of modern usurpation inhabit the politicians’ statute book, which bears no resemblance and pays no respect to universal common laws of truth, justice, liberty, and equality before the law. Common law is inserted into the Constitution to protect (the) people from government abuse of power. Common law legally binds the individual men and women in government thereby controlling the government’s modus operandi. No one is ‘above’ legem terræ, the Law of the Land. There is no judicial or political ‘immunity’ for criminal infractions of common law; and likewise never for government denial of the genuine Trial by Jury Justice System to the private plaintiff or defendant. As distinct from despotism and barbarism, secular common law Trial by Jury is the definitive basis of civilisation, democracy and legitimate government, sine qua non. Reinstating full legality to the status quo by Restoration of the supremacy of secular Constitutional Common Law is the principal duty of all conscientious adults. Democratic Trial by Jury alone proffers the preservation of individuals without prejudice in regard to their nationality, race, gender, religion and background. Are you a theist? A creationist, perhaps? Whatever… If you believe in God, you will marvel at ‘His’ sublime wisdom in providing the natural law’s simple, practical secular means for all men and women everywhere to create and live in the definitive civilised state of Equal Justice. Achieving it is the challenge facing mankind. Common law is secular and applies equally to everyone, the theist, atheist and agnostic alike. Definition. The legal and societal term Natural Law is a sense of right and wrong, justice and equity which arises inevitably from the constitution of the mind of man. This definition requires further explanation. Note that natural law does not refer to the laws of nature, the laws which Science aims to describe. Nor is it to be confused with the opposite phenomenon, “the law of the jungle,” which is the rule for surviving by the use of force to succeed in a hostile or competitive environment. This latter is quite the reverse of natural law and justice. The people’s legem terræ common law of the land is derived from natural law and justice, and Equity, the natural sense of fairness and conscience by which disinterested, randomly-selected people in a jury situation judge. Natural law and justice are timeless, eternal, ubiquitous, secular and universal; not geographically or culturally constrained, nor limited to a set time. Sane humans cannot avoid acquiring an understanding of fairness, equity and justice. From simple human interactions, children everywhere learn to sense injustice even before they learn the words by which to define or explain it. It is for that reason that autocratic villains who wish to control populations into passively accepting intrinsically unjust laws and corrupt ways of living, utilise perverted miseducation to condition (or ‘brainwash’) the mentality of children from an early age: viz. for example, the inculcation by Mohammadans into the minds of the very young of malicious bestial epithets from the Koran such as “apes” and “pigs” for Jews and non-Jews (who are not Mohammadans; Koran, sura [i.e., chapter] 5, verse 60, etc. ); the forced, fabricated ‘inequality’ of women under Koranic sharia ‘law’, including that of a woman’s testimony being equal to only “half” that of a man, etc. ; or statism, socialism, communism “taught” to young Chinese (and others) to the exclusion of the equitable, just system of common law which promotes peace, justice, comity and genuine egalitarianism; or, for example, the National Socialist (NAZI) creed preached at the Hitler Youth, etc. NATURAL LAW PRE-DATES ALL THE RELIGIONS. Natural Law is timeless, permanent and applicable to judicature in a universal context. It is antecedent to the invention of writing, the Epic of Gilgamesh; the hieroglyphic, hieratic and demotic scripts of Ancient Egypt; the Torah; The Pharmacopoeia of Emperor Shen Nung; The Bhagavad Gita; the Old and New Testaments; the Histories of Herodotus and Thucydides, and other texts. This secular commandment stands in perpetual judgement over all the acts and motives of humans as individuals and in groups or collectively. It is The Ethical Foundation of Criminal Liability, providing the Universal Juror at all times and in all places with the means for ascertaining whether the act of the accused was malicious, benign or neutral; whether it was definitively innocent, or criminal: an act of injustice committed with malice aforethought; i.e., guilty. Jesus in Matthew, 7:12; New American Standard Bible. This is the secular commandment at the moral base of all legitimate laws. Laws must be fair and apply equally to all; equitable. In his own words, Jesus was endorsing The Universal Secular Paradigm of Judicature. Understanding Legem Terræ reveals how, through Trial by Jury, the people at large peacefully protect themselves from authoritarian government, villainy and potential holocaust. The natural or universal law and its constitutionally-emplaced common law derivative (viz. Legem Terræ inscribed into the Great Charter Constitution of 1215, of which the only justice system is the judgement of peers: the Trial by Jury), govern government; and inclusively and impartially judge all the acts and motives of men and women everywhere, including atheists, agnostics, theists, Jews, Christians, Buddhists, Hindus, Sikhs, Mormons, Quakers, and, whether they like it or not, Mohammadans, etc. Legem Terræ need not and indeed may not be subjected to interventions, disagreements or debate on metaphysics, the philosophical study of reality concerned with questions such as the existence of God, the external world, the relationship between mind and matter, life after death, and questions unanswerable to scientific observation. Oft-trodden in the history of the ignorant human species, that is the descent which leads to the replacing of the reliable secular, eternal Principles of Natural Law, Equal Justice, Equity and the impartial Constitutional Common Law, by a totalitarian, unlawful society which claims to be of ‘religion’ and/or ‘law’ with concomitant rule by coercion, cruelty, fear, force, even torture; and barbaric, unnatural methods such as those of the Church’s former ‘Holy Inquisition’ and the ongoing ‘Koranic Sharia’; of superstition, unfounded opinion, purblind ‘belief’ and personal prejudice in place of detached rationality, sagacity, logic, compassion, understanding, and science’s evidence and empirical proof. Equal Justice is pure and uncompromising. A natural common law first-corollary to the stricture ordaining honesty and truthfulness is that anyone adopting a thesis which advocates or prescribes mendacity (perjury; taqiyya; kitman; sharia) as a means of advancing a ‘religion’ or protecting its adherents is self-disqualified from jury-service and remains subject to the full rigours of the secular Supreme Constitutional Legem Terræ: the Law of the Land. Definition. To ordain in this context means to order something officially; decree or enact; for example, “We the people…do ordain and establish this Constitution…;” Preamble, USC. When individuals or groups preach sectarian and religious ‘beliefs’ at people and bring them into the courtroom, they divide and distract people from the universally-applicable secular nature of Common Law Trial by Jury. They do a criminal disservice to humanity’s cause of equal justice. Such antagonists to equal justice play into the hands of, and bring delight to, the statist financiers, politicians and judges (with their collusive or unthinking media accessories-to-crime), who otherwise have NO excuse for denying anyone (whatever their personal beliefs and religions) the secular Trial by Jury process of equal justice by, and for, the people. The worst malefactors are those who commit (or are accomplice to) the greatest crimes-and, let the appalling fact be faced, all the greatest crimes known to man have been and are being committed by, or in the name of, government-be it ‘religious’ or secular. So, let us keep in mind the very purpose of proper Constitutions and their Trial by Jury, which is to regulate (1) society, to guide and govern government, to eradicate totally and redress such arbitrary governance as may exist, and thereafter preclude its recurrence. 1 Ref. U.S. Constitution’s co-author James Madison: The Publius Fallacy of Number Ten. The enforcement of such laws as are inequitable (not uniformly fair, applicable or unanimously acceptable to citizen-jurors) is illegal and constitutes judicable crime per se. Today, government denial of Trial by Jury forms an illegal malignance fatal to the aspiration for the achievement of equal justice for all in society. This is a malcondition of the body corporate which common law indicts as, the Illegality of the Status Quo. Some individual men and women (mostly men) from the past and still today, claim to present their followers with a ‘religion’ or ‘spiritualism’ which is “a perfect interpretation” of “the divine will.” Others make that claim on behalf of their religious ‘leaders’, ‘prophets’ or inspirational mentors-but about such views it is certain only that there is no universal agreement as to which is “the perfect religion” or interpretation-or even indeed whether there is a God. Theists like to call natural law “God’s Law,” for its inherent exalted, sublime-even ineffable-qualities of equity and justice, from which derives the secular constitutional common law of mankind. While there is nothing preventing you, me or anyone else from private prayers for guidance, or a belief in what you will... nevertheless, the courtroom requires the secular natural and constitutional common law to be applied so that the innocent are protected regardless of their chosen belief. In this way, the citizens’ secular Trial by Jury prevails dispassionately over humans’ prejudices and fallibility, to interdict all acts of misgovernment and tyranny, secular... and theocratic. This is the same secular commandment which stands in eternal criterial judgement over all the acts and motives of humans as individuals and collectively. Everyone is accountable for their actions (provided a moral choice is open to them) (1). Common law is common in the sense that it is common to all mankind; people everywhere share it in common; it applies to and emancipates everyone equally without exception: all men and women are subject to it and it is the timeless duty of all people to recognise, constitutionally emplace and uphold the supremacy of common law. 1 See section on Ratified Principles of International Law; Chapter Two. Through Trial by Jury, the people re-establish the due primacy of the natural and common law over government statute and case law (‘precedent’, stare decisis); punish and deter crime; resume their rightful prescribed responsible constitutional role to police and regulate their society; nurture the values of equal justice and respect for the rights of others; fulfil the purpose of Trial by Jury to deter and eliminate crime; and they thus uphold the Constitution. The duplicitous legislation by which wealth and/or hegemony accrues to particular preferred people or segments of society, is rapidly and permanently extirpated. The abject ethos of today’s society, so thoroughly contaminated by politico-financial injustice and criminal misgovernance, is speedily transformed for the better. The consummation of the purpose of Trial by Jury (described in the preceding paragraph) constitutes the reason explaining why judges and politicians are active in denying and destroying Constitutional Trial by Jury: the criminally corrupt reveal themselves as such by their very antithesis to Trial by Jury. Whereas all injustices and wrongs from petty tyranny to genocidal holocaust may flow from the denial of authentic Trial by Jury, only from the Trial by Jury-based society can Equal Justice and definitive democracy reliably emerge. Hence, whenever Trial by Jury is denied, the resultant Illegality of the Status Quo of the society, state or government which denies it, embodies the commission of Crime against Humanity. Sir Winston Churchill. Excerpt of telegram from Cairo to U.K. Home Secretary on November the 21st, 1943. Emphases added. *Judicium parium in Magna Carta, Article 39, is the judgement of pares or peers, social equals; also known as Constitutional Common Law Trial by Jury. MEASURING THE LEGITIMACY OF GOVERNMENTS. Legem terræ Common Law is the timeless supreme universal legal and natural moral code which ‘exists’ independently, in judgement over statute law. Common law is indispensable to the maintenance of civil peace, the well-being of all the population, and to the inalienable right of humans to unmolested tranquillity of existence, privacy, and the pursuit of happiness. Hence, it is of supreme importance that, for their own benefit, every teen and adult comes to understand the common law and its Trial by Jury Justice System, and, without compromise, now supports and henceforth ceaselessly campaigns for the restoration of its dominion. Constitutions and governments which may be defined as legal (and as democratic), institute the true Trial by Jury which emplaces and exacts ordinary citizens’ Sovereign Duty as Jurors to acquit as Not Guilty according to the Juror’s conscience, all people tried under law which the Juror judges to be oppressive or unfair. In every republic, state or monarchy, it is constitutional adoption and practical implementation of the Citizen-Juror’s powers and duties in common law Trial by Jury to judge the justice of law and every part of the acts of law enforcement, which define and comprise the basis of legitimate government and democracy, sine qua non. Whether governments acknowledge, submit to and uphold legem terræ common law are the criteria for measuring their legitimacy. "History will recall that the Mission to achieve Restoration and Universal Adoption of the genuine Trial by Jury is the single most important political activity in the civilised world. The well-being, prosperity, protection and happiness of all people depend upon its successful outcome."